Unlike Ubuntu, Peppermint or Fedora, openSUSE is a fully-fledged KDE distribution, and offers the most integrated experience of all the distributions we've looked at. With openSUSE, this approach stretches to non-KDE applications too. For example, despite using GTK+ for its widget toolset, Firefox is skinned to look like a native KDE application. That includes the toolbar icons, framing and file requesters, and even functions like mailing a link will use KDE's mail application rather than the default. It's a similar story with LibreOffice, the forked version of the OpenOffice.org office suite. 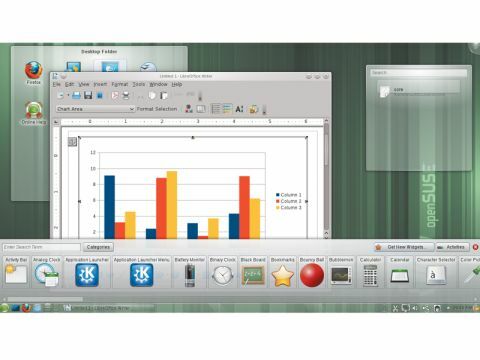 Happily, openSUSE is the first major distro to include it on any desktop, and thanks to Novell's many submitted performance and stability patches, it's also the best Linux office platform available. The KDE desktop isn't particularly attractive. The Novell green and blurred curtain effects of this new release make the default KDE values look good, which is quite an achievement, and very little effort has been made to tame KDE for the average migrant. Changing the name of the desktop settings tool isn't a good design decision for example, and while you can install MP3 and Flash codecs by playing with the repository tool, it's not an Ubuntu solution. Even worse, bundling so much cutting edge software has an adverse effect on quality. The beta version of Firefox 4 is bogged down with bugs, for instance, and there are several show-stoppers that might affect your installation. Other SUSE installations aren't added to the boot menu, and if you're brave enough to install Gnome Shell, it won't work. There's also a well reported lack of stability if you use 32-bit proprietary Nvidia drivers, as most of us do. These problems are unusual for an openSUSE release. Version 11.4 damages a well earned reputation for stability, and early versions are likely to be passed over by all but the most ardent KDE fans.